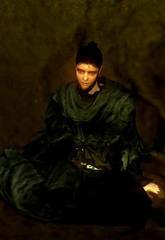 Quelana of Izalith is one of the seven daughters of the Witch of Izalith, currently staying in Lower Blighttown. When her mother attempted to recreate the First Flame, failure appeared in the form of what it's now known as the Chaos Flame. The flames of Chaos engulfed Izalith, killing or mutating the majority of the population into demons. Quelana was able to escape without suffering mutations, unlike her sisters (the Fair Lady and Quelaag) or her brother. Over 200 years before the events of Dark Souls 1, Quelana took in Salaman as her pupil. Being as bungling as the Chosen Undead, Quelana taught Salaman in the arts of pyromancy. It is believed that Salaman went back to the Great Swamp, where he was called 'Master Pyromancer'. He's believed to have started the teaching of pyromancies in his homeland, teaching people like Carmina and possibly Laurentius. For her teachings, Quelana is called to be the 'Mother of Pyromancy'. Quelana seems to have a notable survivor's guilt. She asks the Chosen Undead to put her family, specially her mother, out of their misery. Eingyi refers to Quelana as the "Lost Quelana" and mentions rumors of her wandering in the poison swamp. He suggests that she could be another Daughter of Chaos, and implies that the Fair Lady would be comforted by her presence. She wears the gold hemmed black robes, a set of clothes that are said to have been wore even before the Age of Fire. 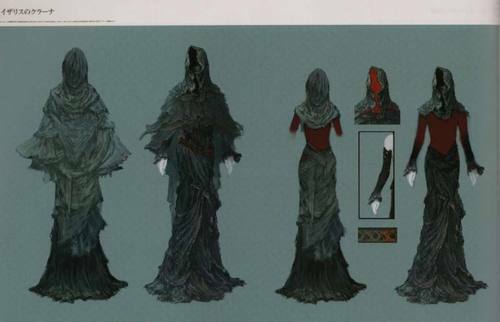 Dark Souls' intro cutscene supports this, since the seven daughters - and their mother, too - are shown to be wearing these clothes. A mere Undead, yet you can see me? and the fact that the body that Ceaseless Discharge guards over specifically mentions Quelana. One could argue that the fact that she escaped Izalith without being mutated is proof of her being dead, but there seems to be another, living Daughter of Chaos in front of the Bed of Chaos boss room, and also a corpse of another in front of Ceaseless Discharge (unless, as in this theory, it is her corpse). This theory can be potentially disproved by the survivor's guilt that Quelana shown or the constant calling of Quelana as the only one who survived the Chaos. Hmm… A mere Undead, yet you can see me? Fascinating… I am Quelana of Izalith. I am not often revealed to walkers of flesh. You have a gift. Are you, too, one who seeks my pyromancy? Like Salaman. Pyromancy is the art of invoking and manipulating fire. But remember one thing. The Witch of Izalith? … Please, do not speak of her. … I abandoned my mother and sisters and fled to this land. Now I roam these parts, feigning ablution, and pretending to seek answers. Her power came from the soul that she found near the First Flame. She focused this power to light a flame of her own, but she failed to control it. The Flame of Chaos engulfed Mother and my sisters, and molded them into deformed creatures. Only I escaped, and now I am here. But my mother and sisters have been in anguish since. I beseech you. Free Mother and my sisters from the Flame of Chaos. Mother's ambitions were misguided, no doubt, but surely a thousand years of atonement is enough! Outstanding… You have done very well. Thank you. I am blessed to have met you. I suppose I can call you fool no longer… I can hardly thank you enough. Please take this… It is all of me. Great Fireball Salaman the Master Pyromancer, also called the Great Fireball after this spell, believed pyromancy was rooted in an adoration of fire. Ascended Pyromancy Flame Pyromancy flame drawing upon the latent power of Quelana of Izalith, mother of pyromancy. 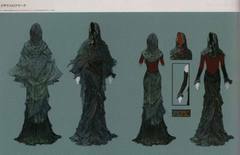 Gold-Hemmed Black Set Worn by the witch Quelana of Izalith, mother of pyromancy and Daughter of Chaos. She wore this before even the Age of Fire, and it offers strong resistance versus fire, poison, and other perils. Fire Tempest The tempestuous raging flames resemble those summoned by the Daughters of Chaos when they challenged the ncient dragons and scorched the very earth. Have you heard of Lost Quelana? An inhuman witch, who wanders the Poison Swamp. only no one has eve seen her, so who really knows? But what if she is another of the Quelaag sisters?